Angry over the court summons to party president Sonia Gandhi and vice president Rahul Gandhi in National Herald case, the Congress stalled the Rajya Sabha for the fourth day on Friday by raising slogans and alleging 'vendetta politics'. 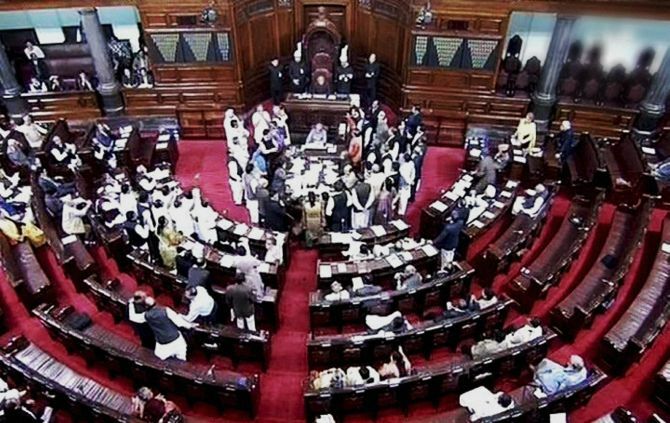 The House was adjourned repeatedly because of the ruckus created by the Congress members soon after it met for the day and Chairman Hamid Ansari mentioned about the 14th anniversary of dastardly terror attack on Parliament House. Several Congress members trooped into the Well of the House shouting anti-government slogans like ‘Modi teri tanashahi nahi chalegi, nahi chalegi (Dictatorship of Prime Minister Narendra Modi will not be tolerated)’ and ‘Hitlershahi nahi chalegi (Hitler-like attitude will not be tolerated)’. Because of the protest, Congress member Bhaskar Rapolu even refused to lay the Report of the Parliamentary Standing Committee on Energy. "Go and present your report. That is your duty. Why don’t you do that," Deputy Chairman P J Kurien told Rapolu who did not relent. He called Rapolu after the first member listed to present the report, Prarimohan Mohapatra of Biju Janata Dal, was not present. Amid the din, a resolution referring The Prevention of Corruption (Amendment) Bill, 2013 to a Select Committee of the House was passed. As Congress members booed, Kurien even got Sukhendu Shekar Roy (Trinamool Congress), Tapan Kumar Sen and K K Ragesh (of Communist Party of India-Marxist) to lay their special mention notices on incidents of intolerance, workers plight in tea gardens and special assistance to Kerala rubber farmers respectively laid on the table. Kurien asked members not to howl, saying howling is not human nature. Minister of State for Parliamentry Affairs Mukthar Abbas Naqvi said, "We are hearing voices (in the House) like those in a zoo." He termed it unparliamentary. "We are very concerned about the Congress members. We also feel pity on them. Let Leader of Opposition get some medicine for his party members so that their throat is clear. Today one week has passed. Earlier they used to shout slogans. Now they are only saying HO HO. We are very much concerned," Naqvi said sarcastically. With the Congress members unrelenting, Kurien adjourned the House till 11.30 pm. But with similar scenes persisting when the House met again, he adjourned it till the noon. There was no normalcy when the House re-convened at 12 pm. Trooping into the Well again, the Congress members kept shouting 'Halla Bol'. Ansari, who was back in the House to take up Question Hour, told the agitating Congress members, "You have done this enough. Please allow Question Hour." Congress MP Vijay Jawaharlal Darda, in whose name a question related to Ram Vilas Paswan's ministry of consumer affairs was listed, raised the issue of the minister's absence from the House. Thereafter, the chairman moved to the next question. As the Congress members kept shouting, the chairman told them, "This is not correct. Please do not do it." However, the din continued and the Chair had to adjourn the House till 12.30 pm. Soon after Leader of the Opposition Ghulam Nabi Azad was seen confabulating the members from his party as well as from the TMC and Janata Dal-United, apparently for a common floor strategy. Ansari again tried to take up the Question Hour when the House met again despite the din continuing. After answers to two questions were laid in the House, Ansari adjourned the House till 2.30 pm commenting that answers cannot be heard in the din.